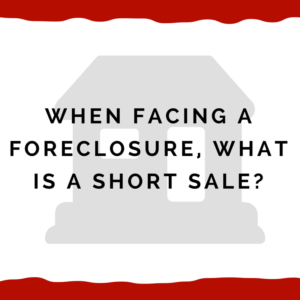 When facing a foreclosure, what is a short sale? A short sale is when you’re facing a foreclosure and you’re wanting to avoid that foreclosure. A short sale is where you agree with the bank to sell your house for less than what you owe. Here’s an example. Suppose you owe $200,000, and you get an offer for $180,000. That’s $20,000 short. You either have to come to the closing table with 20 grand or get your mortgage company to agree to allow this short sale to occur. The advantage of a short sale is that it prevents a foreclosure because you’ve actually sold your house. The downside is, you have to get your mortgage company to agree to do this and sometimes that’s a little difficult to do. You also have to wonder, are they going to come after me for that deficiency or that shortness? That $20,000 in my example. Even if the mortgage company agrees to do this, then you’ve got to decide, is it worth it? A lot of times, you can get them to agree to waive that “shortness” or just not come after you for the deficiency. But, you also need to know how this be reflected on your credit report. There are a number of issues to look at here, but a short sale can be a very valuable alternative to foreclosure. This can be a loan modification, a deed in lieu of foreclosure, or a short sale. There are other options but for our purposes in this article, we are focusing specifically on a short sale. Normally, the process will be that you must attempt to sell your house with a licensed realtor. If that is not successful, then the mortgage company will let you lower the price for a short sale. Once you get an offer, then you need to get the approval of the servicer, and oftentimes, the investor as well. That could be a company like Freddie Mac, Fannie Mae, or it could be some trust. You’ve got to get those guys to approve the short sale and then, ultimately, there’s paperwork that must be taken care of. There is a lot involved in it, but if you are trying to avoid a foreclosure, then a short sale is certainly an option to consider. If we can help you, feel free to call us at 205-879-2447 or fill out our online contact form here. Thanks for watching the video and reading this article. My sister and I inherited some property with a home and a home equity loan attached. My wife and I moved into the house in 2005 to take care of my dad. He died in 2006. We are both disabled and get $2228 per month combined income this year. Since my dad died we have been paying what we could on the H.E.L. That was enough to pay the monthly interest on the $36,000+ H.E.L. to Regions in Gardendale. This year we fell behind in paying bills. Every thing going up except income. As you know, I can work part time and still collect disability. But, I have not been able to find any work. Today my sister received a letter from Regions Bank. They want to foreclose on the house and to sell it Sept. 23, 2015. We need help. What can we do? Be glad to help you — call my office at 205-879-2447 and speak with Carolyn. Hi, My family lives in DFW area In Texas and recently fell behind on 2 of our mortgages with Nationstar mortgage aka Mr. Cooper. We were able to reinstate one of the bigger properties and supposedly that stoped us from foreclosure, but now they’re reversing my payments and the company is making me late on my mortgage payments. For the second smaller property, the house is now going through foreclosure but, we were told that wasn’t going to happen if we filled out proper paper work and sent it back. After doing so, we were told numerous times we were approved and we were waiting to be contacted to make the next payment due for may. To our surprise, we weren’t notified about anything. I took the liberty to call to figure what was taking so long and they informed me I was being lied to because I was never approved for anything and my house is now in process of foreclosure. So say we short sell the house and we owe less than 70,000. And the house is valued at 145,000. What should we expect to get back? Because according to Mr Cooper we have 90,000 in equity? I’m so sorry you guys are going through this — Nationstar can be challenging to deal with. 2. Get with a consumer protection lawyer who is familiar with foreclosures in Texas and RESPA. At least in Alabama (Texas could be different), if you owe $70,000 and sell the house for $140,000, then you should receive $70,000. It is only a short sale if you sell it “short” or less than what you owe. So if Nationstar is saying you have $90,000 in equity, and you owe $70,000, then they must think the house is worth $160,000. (Equity is worth of house minus what you owe). These numbers they have given you may be off so need to verify exactly what you owe, find out the true market value (realtor/appraiser) and then you’ll know better what to do. But if you are facing a foreclosure you must get with a foreclosure defense lawyer. Not just a bankruptcy lawyer but someone who can give you your full range of options. I wish I could help you but I practice in Alabama so get with someone in Texas ASAP.